You’ve seen it on social. You’ve seen the 25% off offer. You’ve seen our excitement around this new location. That’s right, the brand new Roomzzz London Stratford is opening on 1st July and we’re now taking bookings! You can be one of the very first to stay at this gorgeous new aparthotel in the heart of London Stratford. 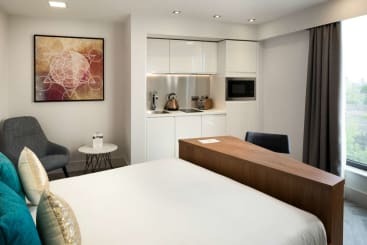 But before you book, here’s some valuable information and a sneak peek at what you can expect from Roomzzz London Stratford. When Does Roomzzz London Stratford Open? Roomzzz London Stratford opens on 1st July 2018. It’s our first Roomzzz Aparthotel location in London and we know you’ll love it as much as we do! Where Is The Aparthotel Located? 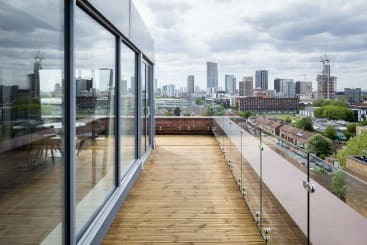 The brand new Roomzzz London Stratford is located in one of London’s most hip suburbs. 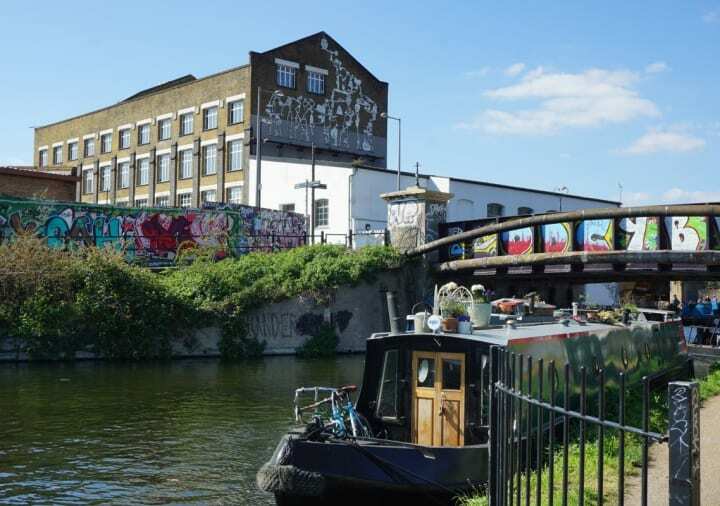 It’s under a 15-minute walk from both Stratford Underground Station and Stratford DLR station, and it’s less than 20 minutes from Stratford International where you can get a high-speed train to London St. Pancras in just 6 minutes! There really are plenty of things to do in London nearby, so it’s totally worth a stay. Yes, there are car parking spaces at Roomzzz London Stratford which is a secure space located under the aparthotel. Spaces are on a first come, first served basis and cost £10 per night, which is good value parking in London. 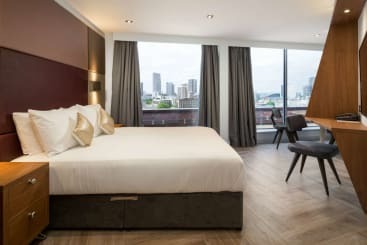 What Are The Rooms Like At Roomzzz London Stratford? Like all Roomzzz Aparthotels there are a variety of rooms to suit both your style and budget. At Roomzzz London Stratford, we have 5 styles of self-catering apartments and here’s a rundown of what each is like. Our Neo Studios fit 2 people perfectly. They’re compact yet have everything you need for a relaxing stay, including a 2000 pocket sprung king size bed, a kitchen with a fridge freezer, microwave oven, and a hob, ensuite bathroom with a walk-in shower. There’s also a desk for any important work you need to do, a smart TV so you can catch up on all your favourite TV shows, and high-speed WiFi! Just like our Neo Studios but with a little more space to make yourself feel at home. We’ve added a slightly bigger sofa and also a dishwasher for those days you just don’t want to do the washing up! With a light and airy feel, the Smart Studios are the perfect choice for all you smart travellers. With plenty of floor space and all the benefits of a Smart Studio, the Grande Studio certainly lives up to its name. For your convenience, we’ve added in a dining table and chairs for those relaxing nights in and there are bedside tables next to the bed too. Our Dezign Studios offer something that little bit extra. These rooms certainly are special. With panoramic views over London from your private rooftop balcony, be prepared to experience Roomzzz’s wow factor. 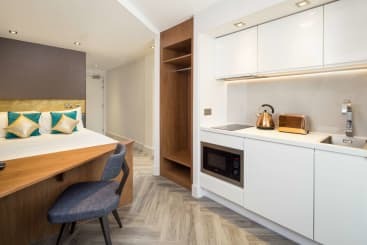 With separate living and sleeping areas, and a kitchen all set up for delicious meals, you’ll feel like you’ve got your very own apartment in the heart of London. 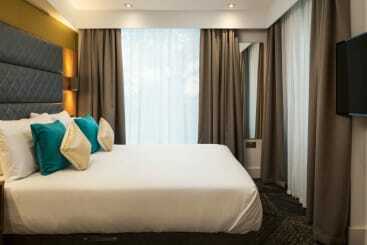 The Liberty Suites are the rooms you want to go for if you’re staying at Roomzzz Aparthotels with family or friends. These, one, two, or three bedroom apartments really are a home away from home and allow that added privacy if you’re staying here as a group. Each Liberty Suite comes with all the features of a Grande Studio but also includes an oven, bath, and a covered balcony with a patio where you can take in the views of London. What Features Are There At Roomzzz London Stratford? That’s right, if you’ve got an electric car, we’ve got electric charging points for you in our parking bay. We like to be forward thinking when it comes to the future of technology and we’ve incorporated useful electric charging points for electric cars, catering for the drivers who’ve already made the change. Just let reception know you wish to use these and you can make sure you and your car are functioning at 100% when you leave Roomzzz. Best of all, these are free to use for Roomzzz guests! Just like all our other Roomzzz Aparthotels, the Grab And Go Breakfast is a big feature of Roomzzz London Stratford. Help yourself each morning, between 6.30am and 10.30am to a selection of fresh pastries – we even have gluten free available if you wish, just let us know in advance or add a note on your booking form – plain or fruit yoghurt, fresh fruit, and tea and coffee. If you want to keep up with your fitness routine while staying at Roomzzz London Stratford, why not use our gym? With all the equipment you need to get that heart rate going, there’s no reason to let your routine slide. Whatever you need, any time of day, the reception and concierge is always open and has the low-down on insider knowledge about the area of London Stratford. 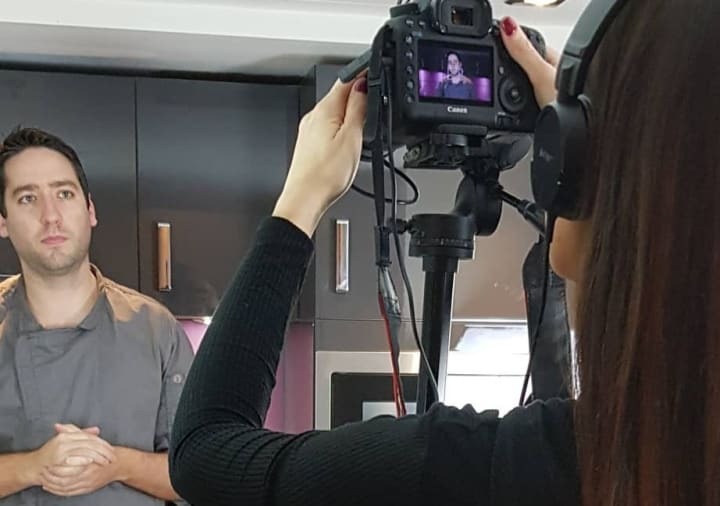 If you can’t go a day without a perfectly crafted barista made cappuccino, latte, espresso, or Americano, Roomzzz London Stratford has it’s very own coffee shop. This is open to both residents and non-residents of Roomzzz London Stratford, so it’s the perfect place to catch up with friends or have a casual work meeting. You don’t just have to chill out in your room at Roomzzz. 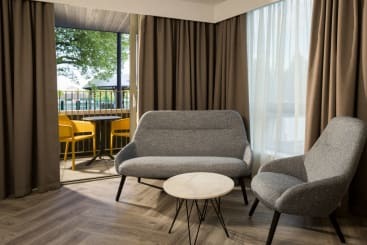 Enjoy the lounge area in Roomzzz London Stratford and take advantage of the comfortable sofas – it’s the first of its kind at our Roomzzz Aparthotels so you’ll be getting a brand new Roomzzz experience when you enjoy our lounge area! We know that employees aren’t as chained to their desks as they used to be. That’s why we’re bringing co-working spaces to Roomzzz! More information will be available soon so keep your eyes open for news on these flexible spaces for when you need to get work done! London Stratford has no shortage of places to eat. Nearby you’ll find Portuguese and Japanese restaurants, and Westfield Stratford has a huge range of choice for food. 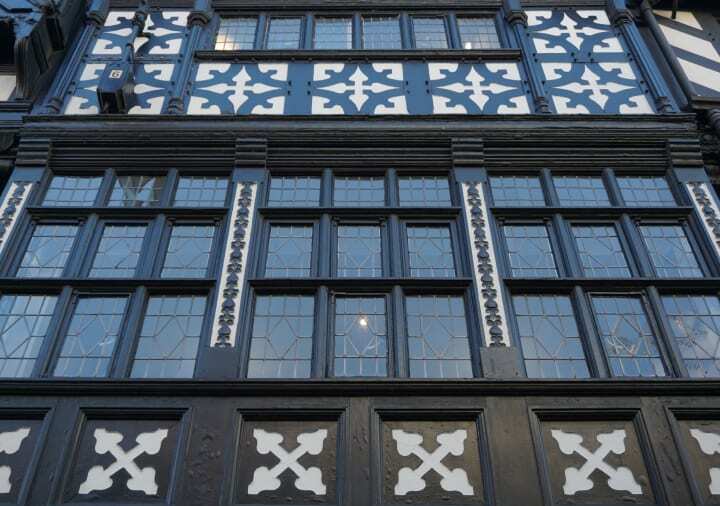 There’s a food court as well as a selection of restaurants including Comptoir Libanais, Levi Roots Caribbean Smokehouse, Potbelly, Shake Shack and The Real Greek, so plenty of great places to eat in Stratford. 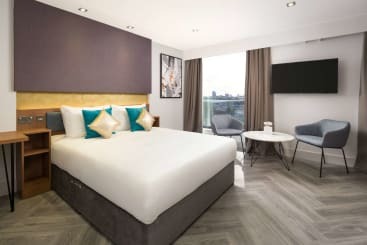 Is Roomzzz London Stratford Near Public Transport? Yes, Roomzzz London Stratford is very well connected to the centre of London and other suburbs around the area. Stratford Underground Station is a 13-minute walk from Roomzzz London Stratford. From here you can easily connect to the Central and Jubilee underground lines as well as the DLR, London Overground, and the TfL Rail. Stratford High Street DLR Station is only a 9-minute walk and from here you can go to Canary Wharf, Bank, London City Airport, West Ham and Abbey Road. 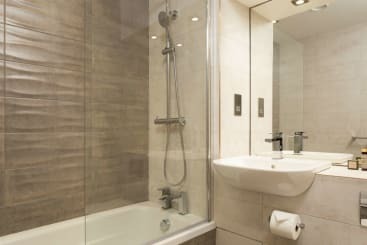 For those that are travelling into London and need access to and from London King’s Cross Station or London St Pancras Station, Stratford International is a 20-minute walk away. You can hop on the high-speed train service which takes only 6 minutes each way. This connection is really handy if you need to be in and out of central London quickly. If you’re travelling to London Stanstead Airport, you’ll be pleased to know that you can easily access one of London’s main airports easily from Stratford. 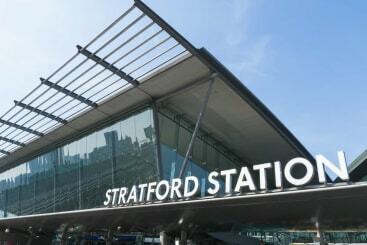 There are plenty of coaches and buses that depart from the bus depot just outside Stratford Centre. London Stratford is one of the most up and coming areas of the capital. 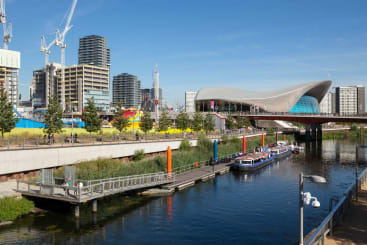 The 2012 Olympics definitely has definitely left a legacy here and visitors can explore the Queen Elizabeth Olympic Park, speed down the slide on the ArcelorMittal Orbit, kayak along the canals, sample the many independent breweries around the area, or shop for hours at Westfield Stratford. It’s a true leisure destination and a great place for friends, families, couples, and business travellers. 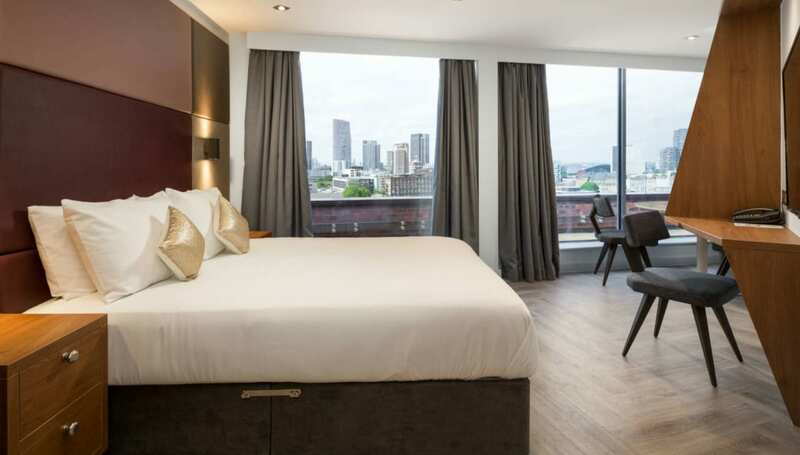 If we’ve tempted you to stay at Roomzzz London Stratford, you can book direct on the Roomzzzwebsite today! Don’t forget, if you do stay with us, use #Roomzzz on your social posts for the chance to win a free night at a Roomzzz Aparthotel location of your choice!